Participants in a PARC-initiated Heart & Stroke Foundation fundraiser at the Rainbow Road Aquatic Centre take part in an Aquafit class led by Brenda Akerman. The event raised more than $2,500. 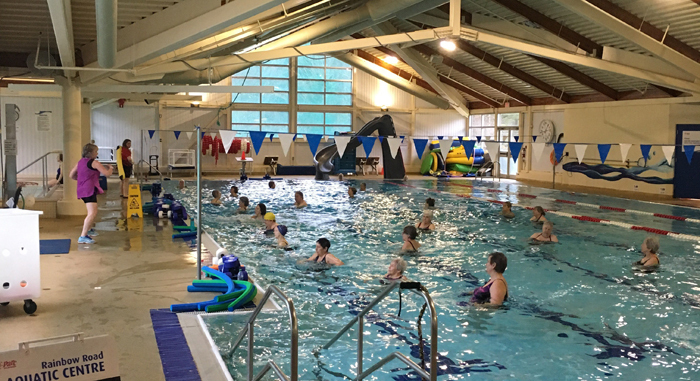 On Saturday, Feb. 2, Salt Spring PARC hosted a charity Aquafit class and swim-a-thon to raise money for the Heart and Stroke Foundation of Canada. Participants first took part in a by-donation Aquafit class led by instructor Brenda Akerman. Following the class, teams of swimmers took to the lanes with the goal of swimming a combined 100 laps in under two hours. PARC recreation programmer Stevie Freer said more than 30 community members attended the event and a grand total of $2,570.40 was raised. Freer thanked everyone who participated, donated funds and prizes, and otherwise supported the event. “Special thanks to Aquafit instructor Brenda Akerman for her help in organizing the event and to Debbie McNaughton, Frankie Johnstone and Laura Jean for their individual fundraising efforts,” he said. February is Heart Month, when various fitness-focused fundraising activities are held across the country.